Wakelee students went on a 45-minute journey through the universe right from teh Wakelee Gymnasium. 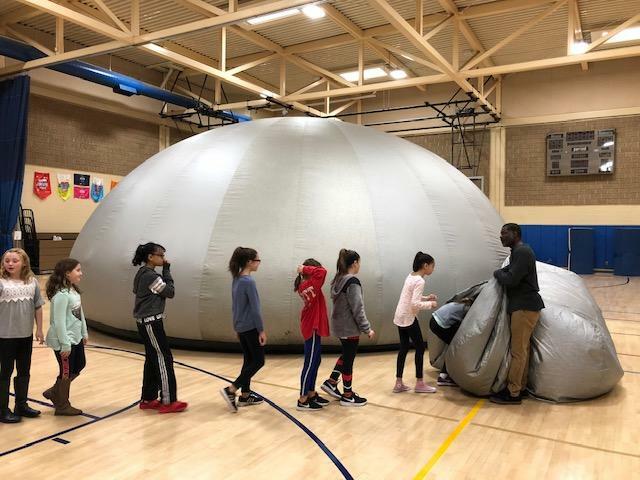 The portable, inflatable planetarium dazzled the young budding astronomers as they were taken on a tour of the solar system. Students entered the dome and were introduced to a "star filled" sky. The navigator guided students through the stars of the Northern Hemisphere exactly as they appear on the day of the presentation. Students learned how to identify every planet in our solar system in dramatic "flights" towards each world. They were introduced to Greek mythological characters and saw how these heroes of the past can be found in the stars. Students witnessed the night sky in different seasons and from different global perspectives.